»The Hope« (»Håbet«) for brass band, chorus, organ, and percussion. In memory of the »Battle on Rheden« - also know as the »Battle of Copenhagen« - (April 2nd, 1801). The work consists of two parts; the first purely orchestral and the second for chorus and orchestra with lyrics from psalm 27. »The Hope« was commissioned by the Admiral Danish Fleet (Danish Royal Navy's Operative Commando) and the Reformed Church of Copenhagen (where Olfert Fischer, Commander of the Danish fleet, lies buried), commemorating the 200th anniversary, in 2001, of the battle of Copenhagen. UPDATE, OCTOBER 2014: »The Hope« is now published by Edition Wilhelm Hansen. Score and parts available worldwide! Note: The choir is only active in Part II. It is possible to perform Part I as a "stand alone" piece for brass band and organ, if no choir is available. 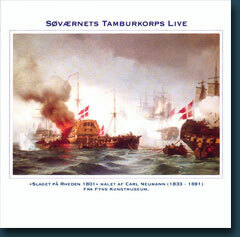 »The Hope« has now been released on the album »Søværnet Ønsker God Vind - med Søværnets Tamburkorps Live« (The Royal Danish Navy Wishes Godspeed - with The Royal Danish Naval Band, Live). The double-CD is however not available for the public to buy in music stores, so »The Hope« must instead be downloaded from here, unless you receive the CD as a gift. Because of that - and to celebrate the (non-public) CD release - I have now re-uploaded the work to the server in an even higher audio quality than before (now virtually indistinguishable from the CD), encoded with the best possible MP3 encoder called "LAME" (see details above). »Håbet« (The Hope) was commissioned by the Reformed Church and the Royal Navy's Operative Commando in memory of Olfert Fischer on the occasion of the 200th anniversary of the Battle on Rheden (Battle of Copenhagen) in 1801. Initially the work was scored for brass band, organ and chorus, but in addition to this I used percussion instruments. The percussion came to play a quite special role, since for among other reasons they were placed both in front of and behind the audience. In this way there was a special effect when the bass-drum, sounding from behind the audience, was answered by cymbals in front - and the other way round - backwards and forwards above the audience, as if cannon balls were flying over their heads. If you should be interested in the score and parts for this piece, please contact me for further information. Notice that even though you may download and listen to the music for free, all rights still belongs to me and the performers (who have all given their permissions). I hope you will enjoy the music and please write your comments and/or reviews here in this thread, if you like. »The Hope« for brass band, organ, percussion and choir is copyright © Frederik Magle. Please do not link directly to the MP3 or lossless audio files (hotlinking) without giving credit and linking to this site (magle.dk) as well. The music has been uploaded for free download with the consent of the copyright holders and in accordance with Danish and international copyright law. It's a very powerful piece! The atmosphere in the first part is so intense I can almost feel the battle taking place. The second (choral) part is very moving and there are some beautiful passages. I have heard it several times and every time I notice something new. Excellent! A Wonderful Composition.Totally "Awesome & Inspiring". Thank you John and Paul (Pamadu) for those wonderful comments! I'm glad you like "The Hope". Getting responses like yours, about my music, makes me very happy! UPDATE: I have just added new information about »The Hope« to the first post in this thread, and also encoded and uploaded a new higher quality version of the MP3. Enjoy! This is great Federik. Thanks for posting it. It has some similarities to LOTR but predates the Fellowship ofthe Ring by several months. Was Howard Shore in the audience? :-) Well done! When I downloaded, I only go the first part. Tried again and the same thing happened. I really would like to hear the choral part. Is there some other way I can hear or down load it? Lookd forward to it - I'm at work now and out of town next week - might be a couple of weeks before I can get to this. l will let you know. lmao.... fab... and as a percussionist, I'd love to play it!! Both myself and my husband put our thumbs up to you and pat you on your back for the dynamic... too many brass banders would hate it, especially bass players... me, love it! The piece is truely inspirational... as a brass bander and composer for the idiom, I really appreciate this music a lot... the organ works so well with the brass instruments as well... LOVE the loud percussion... the piece wouldn't have it's impact without it. When the choir enters, it's just beautiful... love the chords and the movement in general... very moving. The picture you create is just of what you are after.... which is great.... there's so many "new" composers coming out with these titles and they say what picture they are trying to protray and don't quite full it off.... but you do this with style and ease in your writing. sparky, thanks - I'm very glad yo like it and it's great to hear that it works well in 6.1 surround as well! Naomi, thank you so much for that wonderful comment/review. I truly appreciate your professional opinion and kind words, it makes me very happy! Btw, sorry about my sometimes late replies. I hope you forgive me as they are not caused by indifference - on the contrary! I prefer not to rush replying. But my work-load (and the doctors' orders) sometimes makes it impossible to answer right away (that also goes for emails/private messages). Nevertheless an total-production of outstanding quality - thank you again! To my ears this work is very good and obviously created by a skillful composer. "Cantilena" improvisation for organ. Free download!! All times are GMT +2. The current date and time is Apr-26-2019 06:29.